You don’t need an advanced degree to understand the language of sports betting, but you will greatly increase your chances of success if you familiarise yourself with the wide ranging of sports betting terminology. Action: generic term for the number of bets placed on a game or sporting event. Against the Spread (ATS): indicates the betting result of an event that takes the point spread into account. Bad beat: a loss that started off as an apparent easy win before taking a turn for the worst. Bookmaker: an individual or online service which accepts wagers on sporting events. Buy points: the ability a punter has to pay for a half-point or more off the spread. Chalk: the favoured to win team or athlete. Circled game: a game in which there are lower limits due to injuries or bad weather. Cover: the act of winning by enough to cover the point spread. Edge: the perceived advantage a sports bettor has. Even money: a bet which has no vig associated with it and pays out even money if successful. Favourite: the favoured to win team based on the point spread or odds. Future: a wager on an event which will take place well into the future. Hedging bets: betting on the opposite side of a current wager to guarantee a small profit or at the very least minimise losses. Juice: commission earned by the sportsbooks on bets wagered. Limit: the highest amount of money a sportsbook will take on a single bet. Many punters prefer online betting as higher limits are accepted. Lines: another term to describe a point spread. Lock: an apparent easy winner or highly popular favourite. Longshot: a team or athlete considered to have a low chance of winning. Moneyline: describes a way of betting by placing a wager on a team or athlete to win without the involvement of a point spread. No action: the act of a wager being cancelled and money refunded to the bettor. Over/Under: a wager on whether the combined points scored by the 2 teams participating will go over or under the number set by the sportsbook. Parlay: a bet which includes more than one sporting event, each of which must win in order for the wager to be successful. Point spread: an amount of points set by the bookmaker that the favourite gives or the underdog takes as a handicap to make the game more even. Prop bet: an exotic wager on a sporting event beyond the side and total. Push: when the sporting event ends without a clear winner or loser from a betting perspective as the total lands right on the point spread. Side: the team chosen to win and cover the ATS. Spread: a shortening of ‘point spread’. Straight bet: a single wager. Steam: a quick-fire change in the betting line due to heavy wagering leaning towards one side. Total: the combined goals, run, or points scored by two teams in a sporting event. Under: when the amount of combined points scored by 2 participating team finishes below the total posted by the sportsbook. Underdog: the team which is considered unlikely to win. Vig: a shortening of vigorish, also known as juice, which is the bookmakers commission. 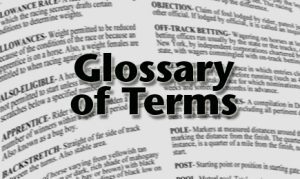 Enjoyed this glossary of sports betting terminology? If so, feel free to share this far and wide!